Honeywell Solid State Electronic Flame Detectors Sense The Ultraviolet Radiations Produced By A Flame And Generates Electrical Signal That Is Amplified And Transmitted To The Primary Burner Control. The Detector's Can Be Mounted Horizontally Or In Vertical Plane. Model C7027/35 Is A Compact Flame Detector Used With flame Safeguard Controls With Compatible Ultraviolet Flame Amplifier. Model C7012 Is a Solid State Electronic Flame Detector Used With Honeywell Flame Safe Guard Controls And Amplifiers Sense's Ultraviolet Radiation Produced By Combustion Of Gas. Oil Or Other Fuels Weather Proof & Ex Proof Versions Also Available. Model C7076 ia a Solid State Dynamic Self Check Adjustable Sensitivity Flame Detector, Used With Compatible Honeywell Flame Safe Guard Controls And Amplifier. This Is Recommended For Off-Process Fuels, Such As H2S Or Flames that are difficult to detect, eg Coal, BF, Producer Gas. Etc. Honeywell Flame Detector Relay Is Essentially A Flame Switch, That Can Be Used In Association With Ultraviolet /IR /Flame Rod Flame Sensors To Signal The Presence Or Absence Of Flame. Model R4348 Is Used For Application In Large Commercial And Industrial Burner Installation Where They Are Used As Simple Flame Switch With 3 Pole Flame Relay And 3 Pole Line Voltage Load Relay. This Can Perform flame Detection And Burner Safe Start Function. The Potential Free Relay Contacts Enables The Use Of This With Wide Range Of Logic Schemes As Per Customers Needs The Add-On Features Include, Flame Intensity Bar Graph Display And 4-20 Ma Flame Intensity Out Put. Microprocessor-Based Integrated Flame Switch for Detecting a Flame Using Rectification, UV Or IR Sources. Can Be Fitted With Any 7800 Series Amplifier To Provide Re" :Y Action From 2 Single Pole Double Throw [SPOT] Relays When Flame Is Present Or Not Present. This Is A Flame Detection Relay Only. 3 Leds To Indicate Power, Flame and Alarm, Compatible With Honeywell Flame Detectors. Honeywell Satronic Burner Controls For Single Or Two Stage Gas/Oil Burners, Available In Electro Mechanical And Solid State Versions With Optional Diagnostic Information Auxiliary Devices, Suitable Photo/Infrared/UV Detectors Are Available. Other Auxiliary Equipments Like Oil/Flowmeters/Oil Preheaters/ Electronic Ignition Devices For Gas And oil burners are also available. 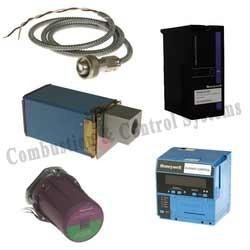 Combustion & control systems, Mumbai offering Honeywell uv flame detector, Honeywell combustion controls, Honeywell gas solenoid valves, Honeywell safety shut off valves, Honeywell gas regulators, Honeywell flame scanner, Honeywell pressuretrol, Honeywell flame amplifiers, Honeywell gas burner relay, Honeywell photocells, Honeywell gas double vales, Honeywell oil burner controller etc..